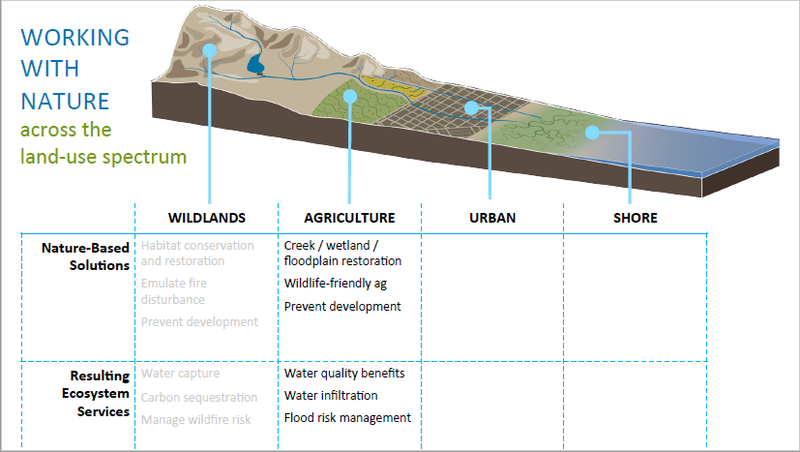 Many approaches to ecological restoration and enhancement of ecosystem services focus on particular parts of the landscape, such as open spaces high in watersheds, urban areas, agricultural areas, waterways, or shorelines. This approach to dividing up large physical and ecological systems might be easier to manage, but may fail to maximize benefits across the full system. At the 2018 Bay Delta Science Conference, Dr. Letitia Grenier, Program Director for the San Francisco Estuary Institute’s Resilient Landscapes Program, gave a presentation drawing on the work of the Resilient Landscapes Program team that highlighted several nature-based interventions providing multiple benefits to people and wildlife in the San Francisco Bay Delta region. These initiatives begin to point toward a path for a new approach to resilience focused on working with nature to benefit from natural processes. California’s landscapes have been highly altered and in a haphazard way, with each individual landowner making the decisions that made sense for their particular goals in each particular moment. 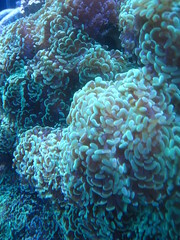 This has created a haphazard hodgepodge of different things happening across the landscape that interrupt and stop natural processes, which in turn has created challenges both now and in the future in terms of getting the ecological processes that we’re interested in to keep functioning in a resilient way. With the way we’re going about it now, we often talk about co-benefits and we know they are happening; they are presumed but not scientifically guided and that means co-benefits are probably not as optimized as they could be. It’s even realizing how much there are or what could be there. There’s also little guidance for the people on the ground making the decisions and implementing these kinds of restoration activities, so that the agencies, landowners, designers, and planners actually know how to do these things in a way that they create the most benefits. What is needed is an overarching multi-benefit plan at scale of the whole system, something Dr. Grenier acknowledged was difficult to do. 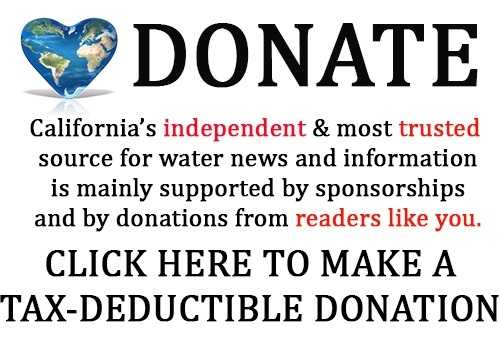 If there is a creek that starts high in the watershed, comes down and goes underground in the middle of the city, comes out near the Baylands between levees, you can’t expect that creek to not flood, to deliver sediment, and to support salmon. The way most places in California have developed is that there isn’t a lot of development in the highlands, the flatter areas have agriculture and cities, and then towards the shoreline, it usually opens up into more natural areas; this is very typical of the bay. 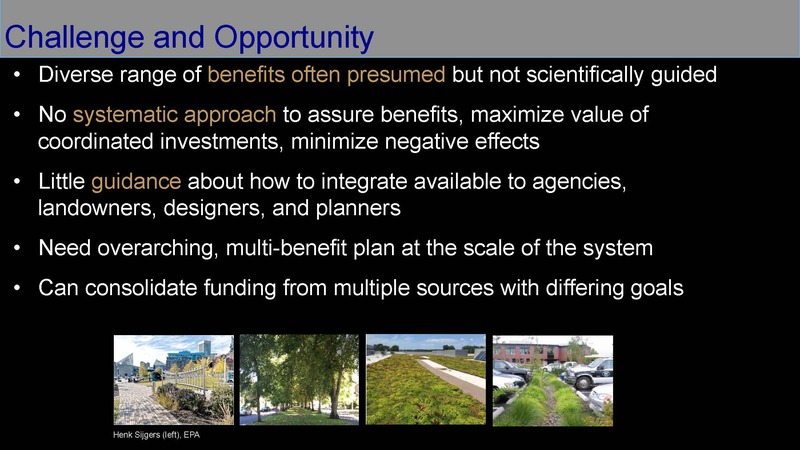 Dr. Grenier pointed out that nature-based solutions need not be purely natural – there can be hybrid solutions; the central idea is that natural systems can provide more benefits and services and a more multi-benefit approach than engineered solutions. “What we’ve seen over the past 100 – 150 years is that engineered solutions are great at maximizing for a single benefit, but then you tend to need to maintain them and they become rigid, brittle and expensive over time,” she said. 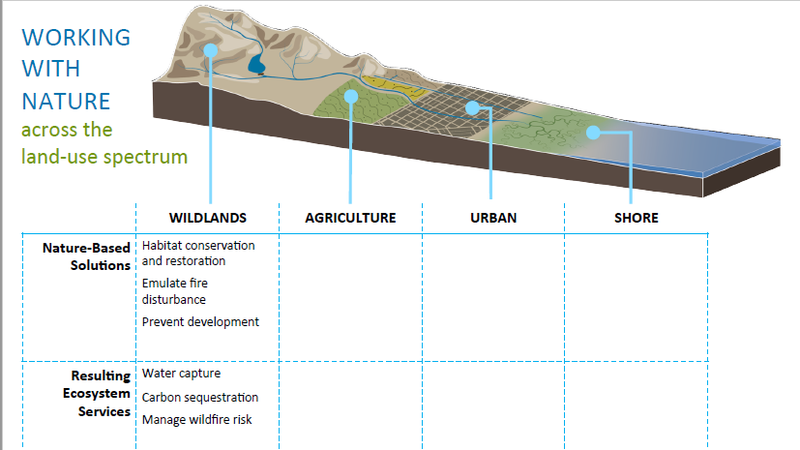 With each of those nature-based solutions, the ecosystem services can then be examined and quantified. For example, in the wildlands, there is a lot of habitat conservation and restoration, and fire disturbance can be emulated in a way that replicates what that natural process would do in the environment. That returns ecosystem services in terms of water captured, infiltration, carbon sequestration, and managing wildfire risk. In agricultural areas, there are a lot of creek, wetland, and floodplain restoration projects happening, including in the Delta. There’s also wildlife-friendly agriculture and preventing development; from that we get water quality benefits, water infiltration, and flood risk management, as well a lot of benefits for nature. She noted that won’t be focusing on nature in this presentation, but more on the ecosystems which should be bundled in a lot of the ecosystem-focused projects. Dr. Grenier presented a map (below, left) of the Laguna de Santa Rosa in Sonoma County; the red line denotes the 100-year floodplain. In this area, several creeks come together, and there are flooding issues as well as several TMDLs for water quality. A comparison of historical to modern wetlands and channel types (above, left) shows the typical loss and fragmentation of habitat types. “We can see that we have some ecosystem service problems and ecological problems, and this project is designed to think of how to solve them at the same time,” she said. Dr. Grenier presented a slide with a conceptual model of how nutrients have been processed through the system in the past, the present, and after restoration, noting that the nutrients are the red dots. Historically, the nutrients would come into the system through the channels and that water was connected to the wetlands; the wetlands would process a lot of the nutrients, and there would be less nutrients leaving the system. Nowadays, there are more nutrients coming in, but the channels are not connected to the wetlands and so they aren’t getting treated, and the nutrients leave the system the way they came in. 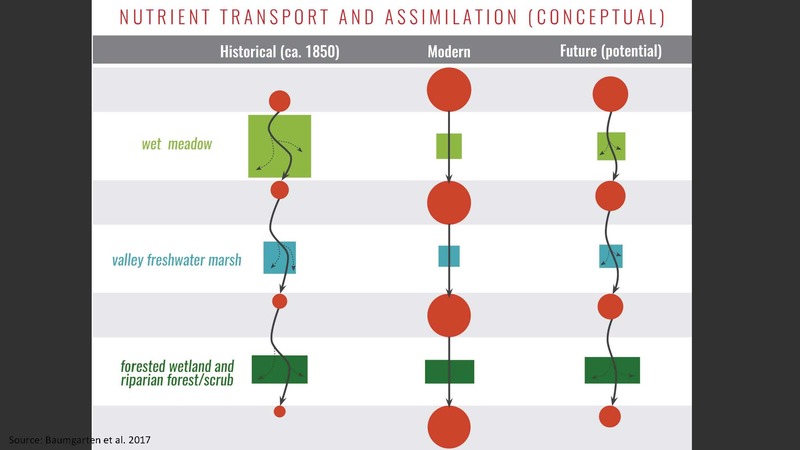 The idea for the future is that it’s not so much about restoring more wetlands; it’s about connecting the wetlands that are there to the channels to allow them to process the nutrients so that there is a reduction at the end of the system. It’s a little bit of a different take on solving the problem; it’s about changing the function rather than restoring a particular habitat type, she said. An overlooked action that can be done in urban areas is to try to restore native plant ecosystems; there are lots of plants in the urban area that do support a lot of different kinds of wildlife. 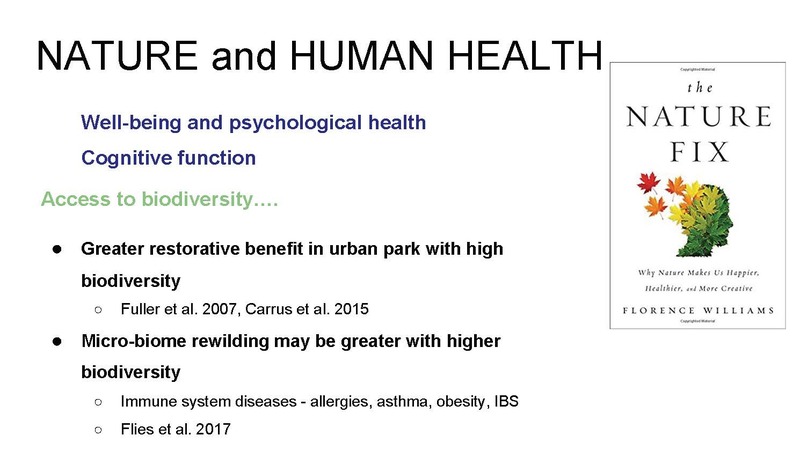 Another benefit of an urban ecology initiative is human health; Dr. Grenier noted that there is more and more research that it improves our physical and mental health to be around biodiverse nature, and there’s evidence that it actually improves our cognitive function and our creativity. 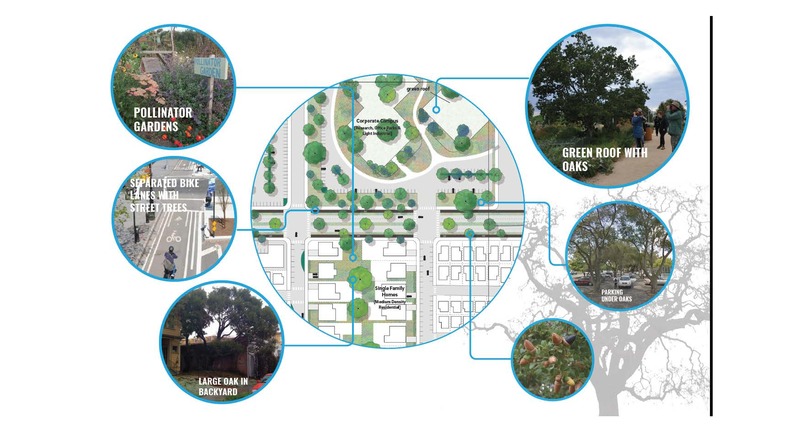 The project, ‘Reoaking the Silicon Valley’, was done in partnership with Google; the idea was to think through scientifically how a native oak woodlands savannah ecosystem could be integrated into the heart of Silicon Valley, which is highly urban. 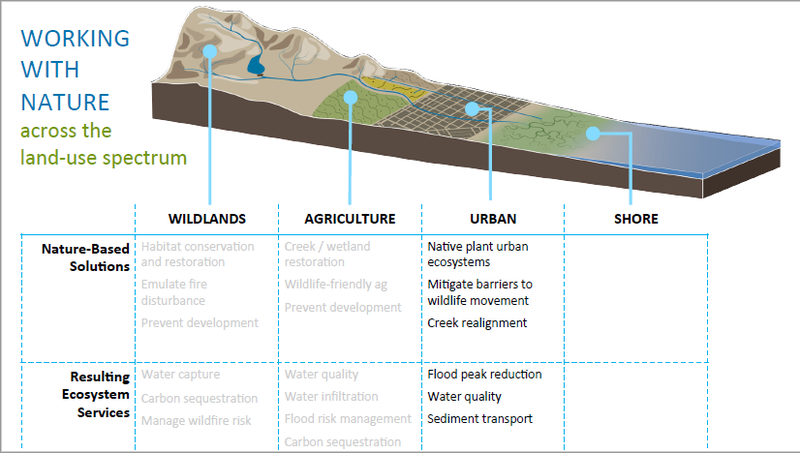 The slide shows the different kinds of interventions and opportunities there are in urban spaces to create small patches of a native ecosystem. “If they are bundled together and you use science to think about how big the patches need to be and how they would be connected to the next patch or other corridors, and the quality of the matrix, you could get to something that’s valuable for native wildlife,” Dr. Grenier said. 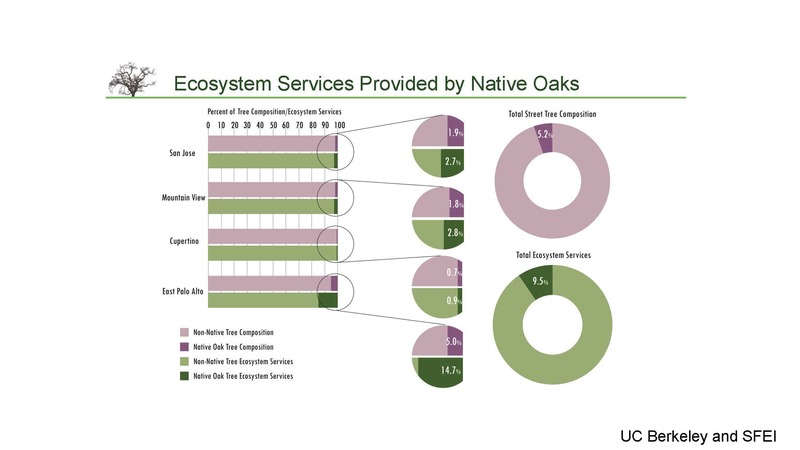 The big purples circles on the slide to the right show that about 5% of the urban street trees in the four cities are native oaks, but they are returning about 10% of the ecosystem services. “We can show how native species can sort of punch above their weight and provide a lot of what people want, as well as supporting wildlife,” she said. They then layered with a tool that was produced by their Clean Water Program which is used to optimize where to place engineered solutions for water quality – installations that are designed to capture stormwater and hold the contaminants that come with it such as swales, street trees or rain gardens. “So if we use this tool that’s a hydrological model that optimizes the placement of those for water quality, we can then extend it to some restoration,” she said. 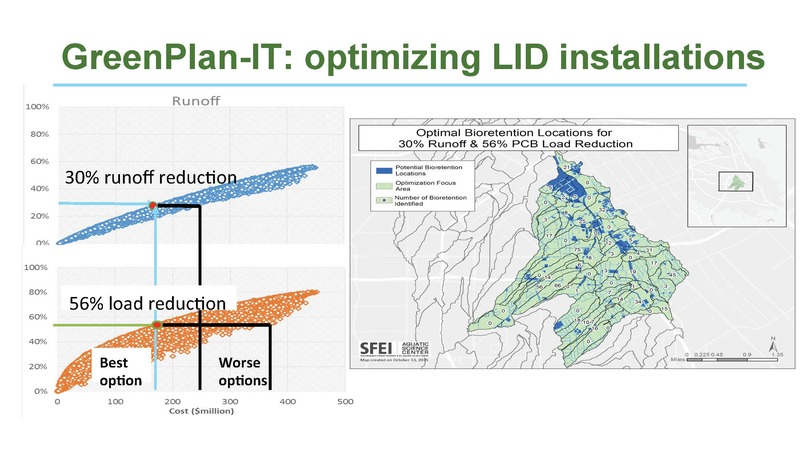 With the Laguna de Santa Rosa project, they used the technique to look at where to do wetland restoration to improve nutrient processing, and in the Silicon Valley, they are looking at where to plant native oak ecosystems to both reduce flood peaks and also improve water quality. 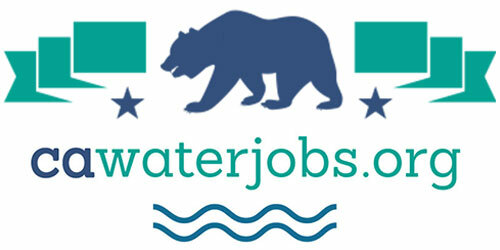 There are a lot of nature-based and hybrid solutions that can be done along the shoreline, such as marsh restoration, beach construction, mudflat augmentation, oyster reefs, and hybrid shorelines, and they can provide services like shoreline protection, carbon sequestration, and water quality benefits. 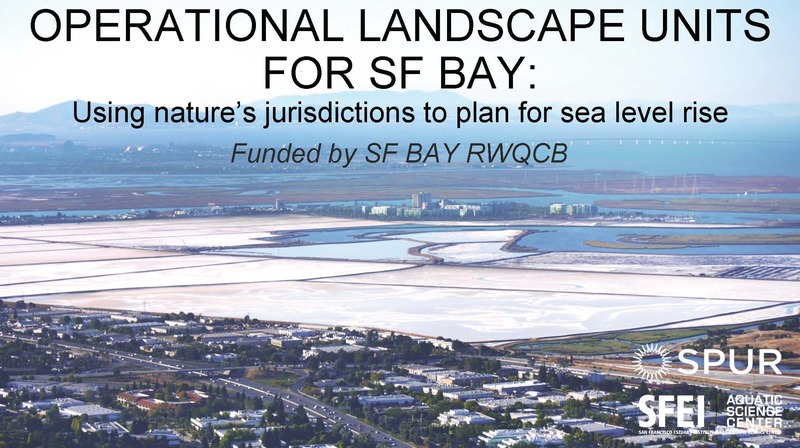 The Operational Landscape Units project, funded by the San Francisco Regional Water Quality Control Board, is a project to take nature-based solutions to the decision makers who are going to be putting forth the projects that need to be permitted around the shoreline. The shoreline was first divided into Shoreline Planning Units that are based on physical processes; this is important because the shoreline is very diverse from steep headlands in small valleys all the way to wide alluvial valleys and different kinds of nature-based solutions are needed in the different areas. The Shoreline Planning Units are useful for getting people together and focusing them on the kinds of things that are appropriate for that area. 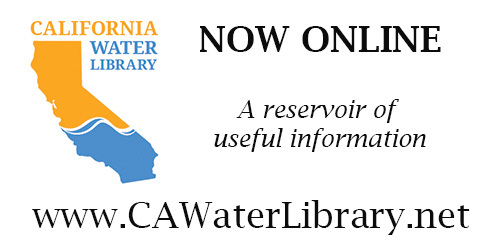 This process is underway right now in Marin County and Contra Costa County with some partners. 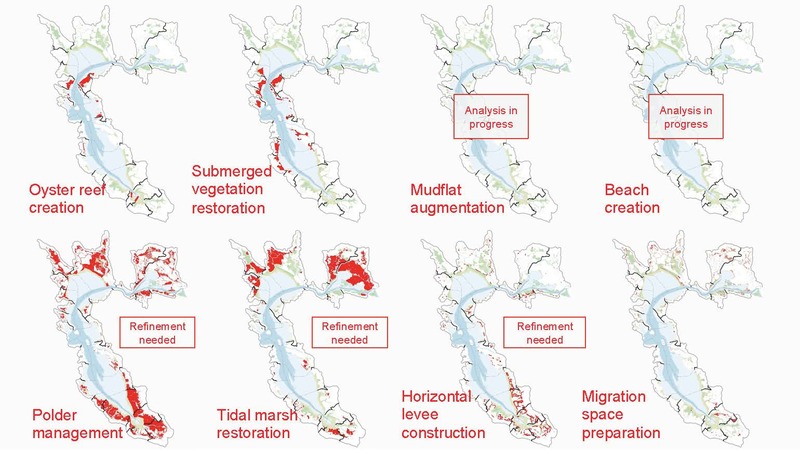 She presented a slide listing the appropriate kinds of nature-based solutions that can be done (upper, left), and some draft maps of Richardson Bay in Marin (upper, right).